Getting in and out of bed can be difficult and even unsafe for the senior population. We will discuss the benefits of using bed assist rail bars and some of the best bed safety rails to consider installing on your own bed, or if you are providing medical care for that of an elderly loved one. We have researched, reviewed and tried out many different bed grab bars, portable bed rails, and patient lifts so that caregivers and seniors can make the best choice for care. Keep reading for more information on the best bed assist bars for seniors. 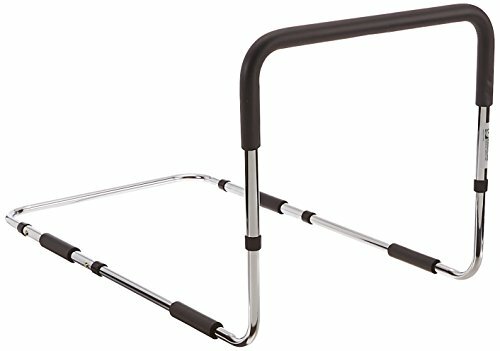 What Are Bed Assist Rail Bars? What Are Bed Rail Assist Bars? 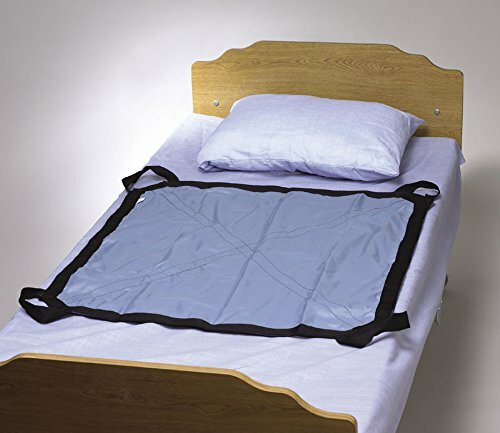 Bed rails or bed assist bars for seniors make a bed safer and offer stability when getting in and out of bed. Bed rails can also help prevent an individual from rolling or falling out of bed. An elderly individual who is recovering from surgery, has limited mobility, or poor balance, may feel more confident, safe and independent when using a bed rail assist bar. Bed rail assist bars also allow seniors and elderly to age in their own home instead of needing to move to an assisted living facility. Risk of falling out of bed decreases and seniors can maintain some independence. Not only do bed assist rails provide support when an individual gets in and out of bed, but they can be helpful when someone has a difficult time getting comfortable or needs to adjust a position in bed. Bed safety rails are available in various designs, and most are compatible with any size or type of bed at home, including manual or electric hospital beds, adjustabled beds, and regular mattresses from twin to king-sized. Some bed assist rails are easy to remove from the bed while others are intended to be more permanent. Whether you need extra padding or a place to store glasses or magazines, there are plenty of options available. Most bed assist rails are easy to install. Before installing a bed rail, always double check that you have all the parts needed to set up the rail properly and that your installation instructions are nearby. While many bed assist rails have a similar design and setup, you should always refer to the instructions that come with the rail before installing. The steps for installing a bed assist rail may vary slightly based on the design and type of bed support rails that you’ve chosen. After laying out all the pieces, double checking that you have all of them, don’t forget to follow the directions which come with the bed assist. Assemble the brace bar with the support frame pieces, making sure that the arrow on the support pieces is pointing upwards. Attach the base frame to the support frame pieces and then the leg pieces to the support pieces. After assembling the pieces, attach the assist bar to the support frame. If your bed rail comes with a storage pocket, attach it to the support frame. Now that the bed assist rail is fully assembled, double check to make sure all the pieces are locked into place and that the finished piece looks like the diagram. The next step involves installing the rail onto your bed. After you take the mattress off of the bed, place the bed assist rail on your bed (it will be between the bed frame or box spring and mattress). Adjust the height of the legs if needed and use the loops on the legs to secure it (if possible). Always test out the rail before using. Fall-related injuries can happen anywhere in the home. The following tips and assistive devices may help your elderly loved one stay safer in their bedroom and other areas of the home. 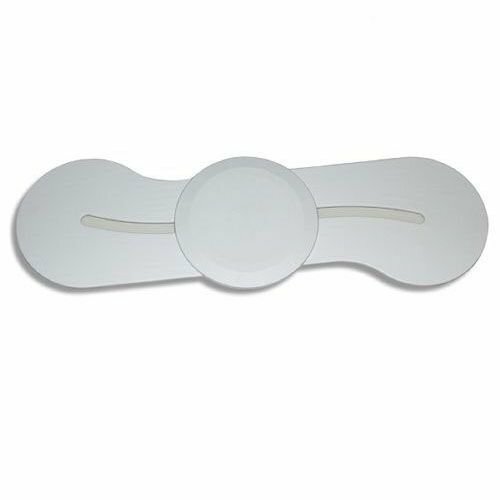 We’ve done some research and chosen some of the best bed assist rails; check to see which bed assist handle works best for you or your elderly loved one that you provide care and aid for. The Medline Bed Assist Bar is made of lightweight and heavy duty steel. The simple design is ideal and easy install is ideal for anyone who needs a little assistance with getting in and out of bed. The rail fits most twin to queen-sized beds. The bar is adjustable and comes with a mesh pocket for storage. 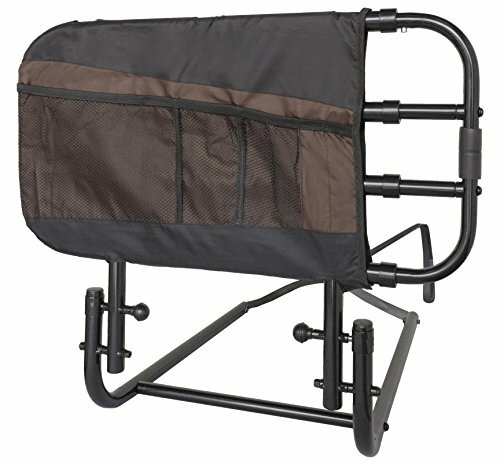 This is a great option if you are looking for a portable bed rail. This Stander EZ Adjust Bed Rail is an excellent choice for anyone who wants a larger bed rail that can help with getting in and out of bed as well as preventing falling out of bed. The heavy duty rail folds and pivots to make it easier to get out of bed. Installation is easy, and it can support weight up to 300 pounds. The Essential Medical Supply hand bed rail is height adjustable has a similar basic design as the Medline assist bar, but this bar fits any bed frame from twin up to king-sized beds. The safety bed rail supports up to 300 pounds, and a strap ensures a tight and secure fit; there’s no slipping or moving between the box spring or mattress. 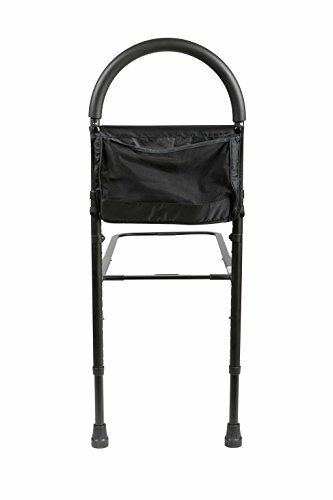 If you are looking for portable bed rails that fit any size bed while you travel then this is your best bet. Users of the bed safety rails and grab bars that we reviewed like the ease of installation and the confidence they feel when getting in and out of bed. While these bed assist safety bars all have a slightly different design, users felt safe in bed without feeling uncomfortable or too confined. Transfer sheets, which are often known as slide sheets, are ideal to use if you need to move or reposition someone who has little to no mobility. A transfer sheet, or also known as patient lifts, is safer for the elderly individual and the person who is helping them move. A transfer bar is similar to a grab bar in that an individual can pull their body up and hold on to the bar while getting in and out of bed. Many transfer bars are attached to a vertical pole (which is grounded to the ceiling and floor). Much like transfer sheets, slings and belts are a helpful safety strap that make it easier to move an individual with little to no mobility in and out of bed. It’s safer for the individual who needs assistance and the person who is helping. While bed rails are helpful to grab on to, slings and belts help hoist and move someone. 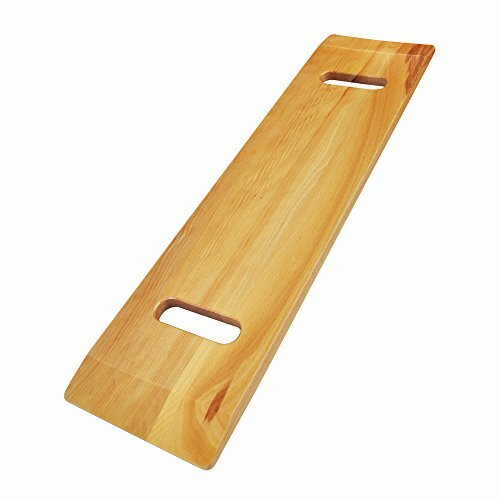 Transfer boards work similarly to slings, belts, sheets, and safety straps, but are ideal in situations where an individual has no mobility or should be moved with extra caution (and not bending or jostling the body). A Beasy board is a unique transfer board that eliminates the need for lifting, and it’s easier to move an individual with little to no mobility. Beasy boards are designed to work in a variety of situations, such as transferring an individual from a bed to a wheelchair. We believe the Medline Bed Assist Bar, Stander EZ Adjust Home Bed Rail, and Essential Medical Supply Hand Bed Rail are the best bed assist rails on the market. Our pick for the best bed assist rail would have to be the Essential Medical Supply because of the adversity in fitting all different sizes of beds from twin to king. But it really depends on your preferences. If you want a bed rail that you can fold down then the Stander EZ Adjust is the one for you. If you like the idea of having a storage pocket in a lightweight and sturdy bed rail, then the Medline Bed Assist Bar could be your choice. Hopefully this review of bed assist rail bars can help you make the decision in choosing the best bed assist rail. If you have any questions or comments please leave them below! My stepdad was having such a hard time getting out of bed and I’m so happy we bought him the Essential Medical Supply Height Adjustable Hand Bed Rail. It’s very sturdy and slides right under his mattress. I feel so much better now knowing he can easily grab on to the rail and pull himself up much better. Thanks for sharing your feedback, Charles! Really happy to hear you chose a great bed rail for your stepdad and he’s able to get up better now on his own. The Medline Bed Assist Bar works perfectly for me. It’s very lightweight but also so sturdy. I was having issues with my knees and I was so afraid I would end up falling someday getting out of bed. This has definitely been one of my best purchases I’ve made recently. Thanks for sharing with us, Janice! We really appreciate your feedback. Sorry to hear about your knee problems but I’m glad the Medline bar is helping you get out of bed easier.